Being inherently linked to the governments planning objective of creating secure, quality places where people wish to live and work, Secured by Design has been cited as a key model in the Office of Deputy Prime Minister's guide 'Safer Places - The Planning System & Crime Prevention' and in the Home Office's 'Crime Reduction Strategy 2008-11'. 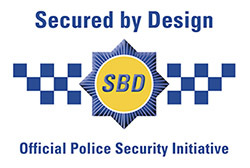 To achieve secured by design accreditation, manufacturers must ensure that their product meet the the security standards specified by SBD. In the case of Pinefield Glass our windows and doors have been successfully tested PAS24:21012.